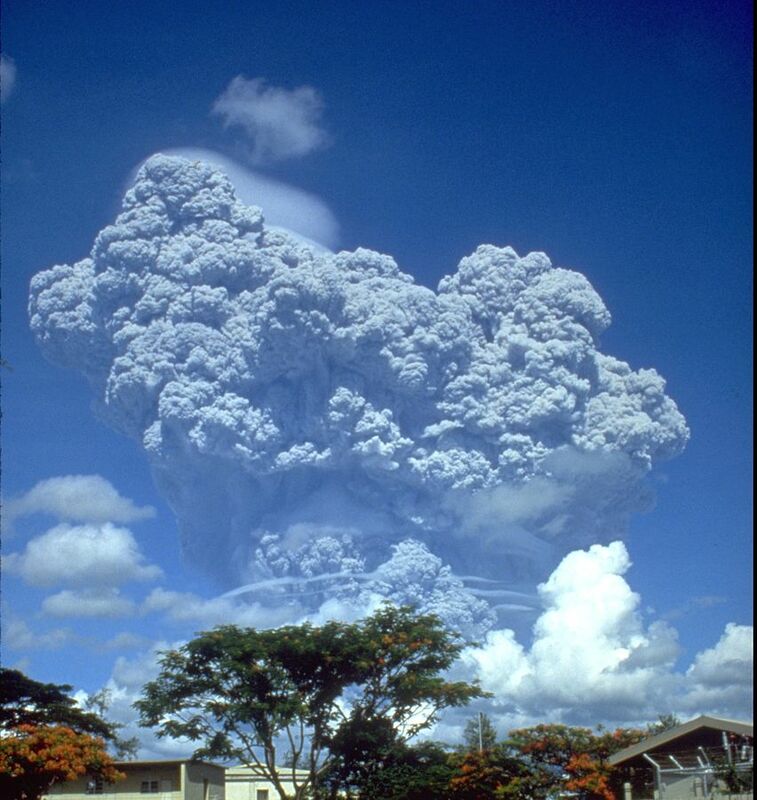 The eruption of Mount Pinatubo in the Philippines on 12th-16th June 1991 was the second-largest terrestrial eruption of the 20th century, exceeded only by the 1912 eruption of Novarupta in the Alaska Peninsula. It produced the largest stratospheric SO2 cloud ever observed by modern instruments, and the major stratospheric aerosol event since Krakatau exploded in 1883. The aerosol cloud spread around the Earth in about three weeks and achieved global coverage about a year after the initial eruption. It is estimated that this eruption caused surface cooling in the Northern Hemisphere of up to 0.5 to 0.6˚C. It ejected roughly 10 km3 of magma, and 20,000,000 tonnes of SO2. The large Pinatubo stratospheric SO2 cloud began to spread rapidly and oxidize to form stratospheric sulfuric acid aerosols. Approximately half of the SO2 had been converted to sulphuric acid aerosols by 21 to 28 days after the eruption. It injected more particulate into the stratosphere than any eruption since Krakatoa in 1883. As a result global temperatures dropped by about 0.5 °C in the years 1991–93. This eruption resulted in unprecedented observations of both radiative forcing from volcanic aerosols as well as the climate system’s response to this forcing. Satellite observations confirmed the decrease in solar heating due to Mount Pinatubo aerosols, which led to a global cooling of the lower troposphere. On July 16, 1990, a magnitude 7.8 earthquake (comparable in size to the great 1906 San Francisco, California, earthquake) struck about 100 kilometers northeast of Mount Pinatubo on the island of Luzon in the Philippines, shaking and squeezing the Earth’s crust beneath the volcano. At Mount Pinatubo, this major earthquake caused a landslide, some local earthquakes, and a short-lived increase in steam emissions from a preexisting geothermal area, but otherwise the there were no immediate consequences. 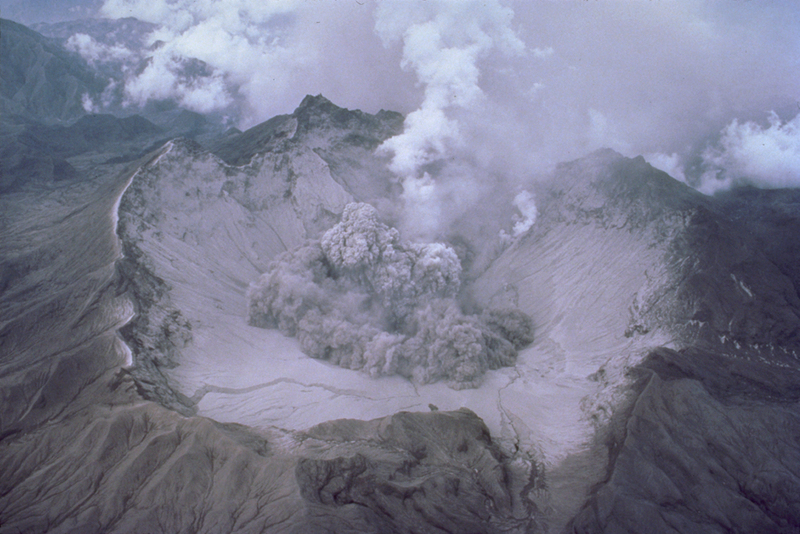 In March and April 1991, however, molten rock (magma) rising toward the surface from more than 32 kilometers beneath Pinatubo triggered small earthquakes and caused powerful steam explosions that blasted three craters on the north flank of the volcano. Thousands of small earthquakes occurred beneath Pinatubo through April, May, and early June, and many thousand tons of noxious sulfur dioxide gas were also emitted by the volcano. From June 7 to 12, the first magma reached the surface of Mount Pinatubo. Because it had lost most of the gas contained in it on the way to the surface, the magma oozed out to form a lava dome but did not cause an explosive eruption. However, on June 12 (Philippine Independence Day), millions of cubic yards of gas-charged magma reached the surface and exploded in the reawakening volcano’s first spectacular eruption. When even more highly gas charged magma reached Pinatubo’s surface on June 15, the volcano exploded in a cataclysmic eruption that ejected more than 1 cubic mile (5 cubic kilometers) of material. The ash cloud from this climactic eruption rose 22 miles (35 kilometers) into the air. At lower altitudes, the ash was blown in all directions by the intense cyclonic winds of a coincidentally occurring typhoon, and winds at higher altitudes blew the ash southwestward. A blanket of volcanic ash (sand- and silt-size grains of volcanic minerals and glass) and larger pumice lapilli (frothy pebbles) blanketed the countryside. Fine ash fell as far away as the Indian Ocean, and satellites tracked the ash cloud several times around the globe. Huge avalanches of searing hot ash, gas, and pumice fragments (pyroclastic flows) roared down the flanks of Mount Pinatubo, filling once-deep valleys with fresh volcanic deposits as much as 660 feet (200 meters) thick. The eruption removed so much magma and rock from below the volcano that the summit collapsed to form a large volcanic depression (caldera) 1.6 miles (2.5 kilometers) across. Much weaker but still spectacular eruptions of ash occurred occassionally through early September 1991. From July to October1992, a lava dome was built in the new caldera as fresh magma rose from deep beneath Pinatubo. Fortunately, scientists from the Philippine Institute of Volcanology and Seismology and the U.S. Geological Survey had forecast Pinatubo’s 1991 climactic eruption, resulting in the saving of at least 5,000 lives and at least $250 million in property. Commercial aircraft were warned about the hazard of the ash cloud from the June 15 eruption, and most avoided it, but a number of jets flying far to the west of the Philippines encountered ash and sustained about $100 million in damage. Although much equipment was successfully protected, structures on the two largest U.S. military bases in the Philippines–Clark Air Base and Subic Bay Naval Station–were heavily damaged by ash from the volcano’s climactic eruption. Bluth, Gregg JS, Scott D. Doiron, Charles C. Schnetzler, Arlin J. Krueger, and Louis S. Walter. “Global tracking of the SO2 clouds from the June, 1991 Mount Pinatubo eruptions.” Geophysical Research Letters 19, no. 2 (1992): 151-154. Randel, William J., Fei Wu, J. M. Russell, J. W. Waters, and L. Froidevaux. “Ozone and temperature changes in the stratosphere following the eruption of Mount Pinatubo.” JOURNAL OF GEOPHYSICAL RESEARCH-ALL SERIES- 100 (1995): 16-753. Soden, Brian J., Richard T. Wetherald, Georgiy L. Stenchikov, and Alan Robock. “Global cooling after the eruption of Mount Pinatubo: A test of climate feedback by water vapor.” Science 296, no. 5568 (2002): 727-730.